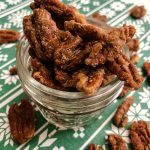 This easy stovetop candied pecans recipe is great for holiday entertaining and gift-giving! But it's also a great topping for soups and salads. You can also enjoy it as a delicious sweet and salty snack option! Add brown sugar, butter, water, cinnamon and salt to a large sauté pan. Mix the ingredients over medium-low heat and heat until it's hot and bubbles. Add in the pecans and mix to coat. Cook for 10-15 minutes, stirring frequently. The sauce will cook down and glaze the nuts. Pour onto a sheet on parchment paper and allow to cool completely. Then break apart and enjoy! You can add a bit of vanilla for some extra flavor if you're a fan of vanilla.